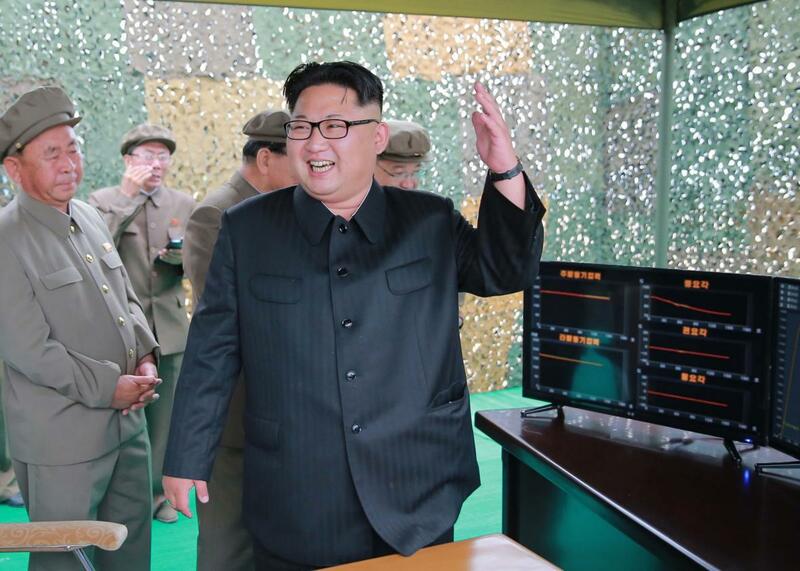 Pentagon has been waging secret cyberwar against North Korea missiles for years. This undated picture released from North Korea’s official Korean Central News Agency (KCNA) on June 23, 2016 shows North Korean leader Kim Jong Un inspecting a test of the surface-to-surface medium long-range strategic ballistic missile Hwasong-10 at an undisclosed location in North Korea. Former president Barack Obama was frustrated by the country’s traditional antimissile systems so three years ago he sent an order to the Pentagon: ramp up the cyber warfare campaign against North Korea’s nuclear and missile program. The goal? Sabotage any test launches within seconds, reports the New York Times. And sure enough, shortly thereafter lots of North Korea’s rockets started to fail. While some were quick to credit the heightened cyber warfare campaign, others weren’t so sure, saying it likely had more to do with manufacturing errors and disgruntled workers. To bolster that view, some cite the way North Korea has had three successful missile tests in the last eight months. The New York Times talked to officials and reviewed documents to come to the conclusion that the United States can’t effectively push back against North Korea’s nuclear and missile program. Little wonder then that Obama told incoming President Trump that North Korea would likely be his most urgent program. He could order the escalation of the Pentagon’s cyber and electronic warfare effort, but that carries no guarantees. He could open negotiations with the North to freeze its nuclear and missile programs, but that would leave a looming threat in place. He could prepare for direct missile strikes on the launch sites, which Mr. Obama also considered, but there is little chance of hitting every target. He could press the Chinese to cut off trade and support, but Beijing has always stopped short of steps that could lead to the regime’s collapse. Earlier in the week, the Wall Street Journal reported that an internal White House review on North Korea included “the possibility of military force or regime change to blunt the country’s nuclear-weapons threat.” He has also been calling on Beijing to step up. “You gotta work on North Korea,” Trump allegedly told a Chinese official earlier this week. During the transition we had already gotten hints that the Obama administration had warned their successors about North Korea. In November, the Wall Street Journal reported that the outgoing administration had warned Trump’s transition team that it considered North Korea to be a top priority in terms of national security. Trump had hinted at this during an interview earlier this month, saying Obama had warned him about “a military problem with a certain place.” The president declined to get into specifics. The Times story was published shortly after a U.N. report noted that North Korea continues to evade U.N. sanctions in Africa with few, if any, repercussions.